High Noon Reading is a reading intervention program for students in grades 3 and above that focuses on the development of decoding, fluency, and comprehension skills while also building skills in spelling, writing, and vocabulary. Each level follows a sequence of skills that correlates to the skills typically taught in classroom reading programs. Phonic Reading Lessons differs from other approaches in the consistency with which sound-symbol relationships are presented and reinforced. Each lesson requires just 10 to 15 minutes to complete, and the program can be used with students from the early grades through adulthood. Designed for any student needing phonetic decoding and spelling training controlled to basic vocabulary. Teachers Manual provides instructions for entire student text. 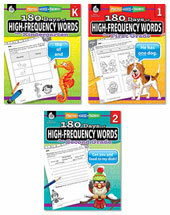 High Noon Reading Fluency is a four level program designed to give students the extra practice they need to help build fluency (speed, accuracy, and comprehension), a crucial benchmark that defines success in reading. Breaks down language into seven basic levels. At each level student is given basic concepts as a starter, then lists of new words to show these principles in operation. The High Noon Reading Comprehension program gives your students the extra comprehension skill practice they need to achieve mastery in reading. This program includes high-interest passages appropriate for students reading below grade level. The 180 Days series of books offers a variety of brief daily lessons with necessary concepts and information geared toward immersing your students in each subject and forming good habits. The 180 Days series of books offers a variety of brief daily lessons with necessary concepts and information geared toward immersing your students in each subject and forming good habits. Each practice allows your students the opportunity to evaluate their understanding of a concept and celebrate their improvement success. Build reading skills and increase the ability to recognize sight words instantly with this invaluable classroom resource.